This is one of my absolute favorite casseroles. If you live in Chicago, you are probably familiar with Lou Malnati’s deep-dish pizza. My favorite, by far, is “The Lou.” This is deep dish pizza topped with spinach, mushrooms and sliced tomato topped with mozzarella and cheddar cheese. And yes, it’s as good as it sounds. This casserole is topped with sliced tomato, cheddar cheese, and a delicious feta topping. Trust me…it’ll knock your socks off. Feel free to add ground beef, turkey, or chicken for some added protein. Eliminate meat for a veggie option. First things first….start the rice cooking. Do not cook the rice the full amount of time. Take rice off heat 10 minutes early. So, if you are doing white rice, which cooks in about 20 minutes, just cook it for 10. If you are doing brown rice, which often cooks for 40 minutes, just cook it for 25 or 30 minutes. We are going to only partially cook the rice so that it will finish cooking in the oven and soak up all the zucchini liquid that is released. Otherwise the casserole can have excess liquid. 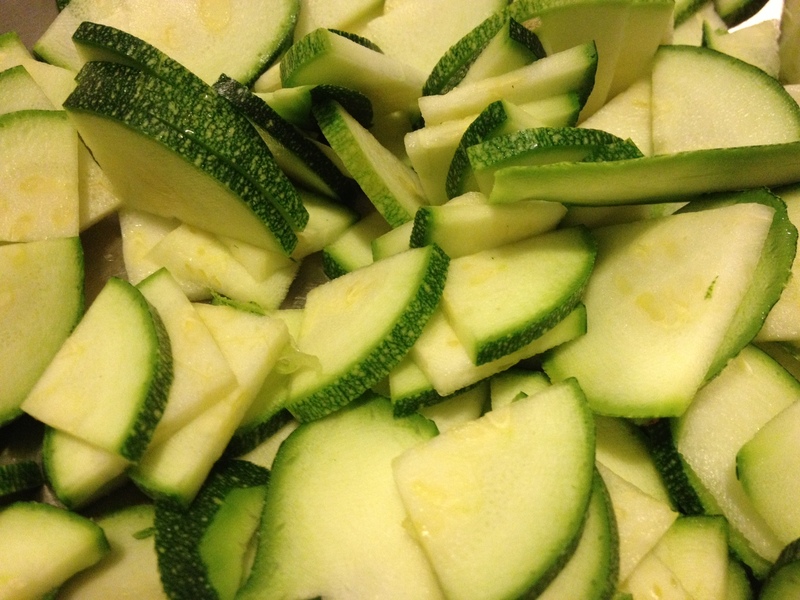 While rice is cooking, slice the zucchini. I use a food processor to save time and slice them fairly thin. Heat oil in large dutch oven or pot. Add onion and garlic. Cook until onion are translucent (about 5 minutes). Add zucchini, dried herbs and pepper. Cook for about 5 minutes, or until zucchini starts to become tender. In a large bowl, whisk the eggs. Add the feta and cottage cheese to the eggs. About this time, the rice should be done. Put rice in large bowl and add tomato paste, soy sauce and parsley to the rice. Now we assemble the casserole…. First, add the rice to the bottom of the casserole dish. If adding meat to the recipe, add it to the zucchini mixture at this time. Put zucchini and onion mixture (and meat, if using) on top of the rice. 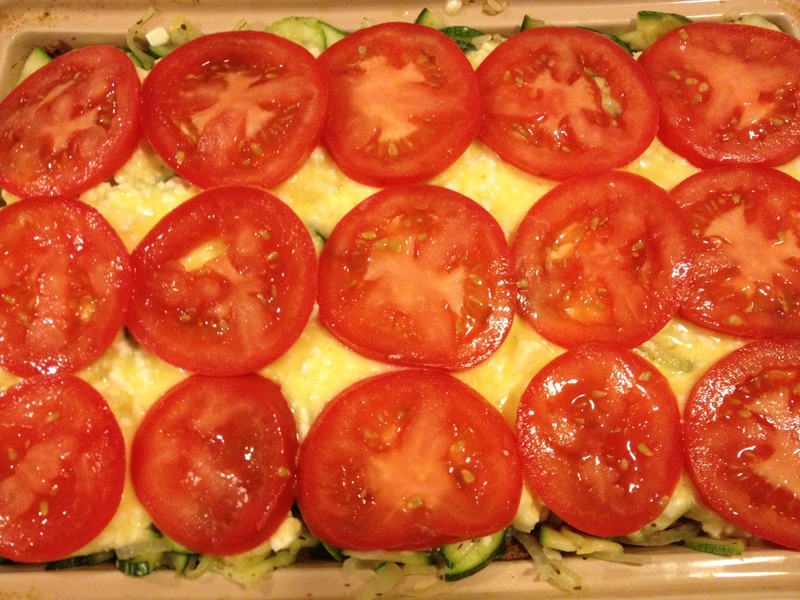 Spread cottage cheese, feta and eggs mixture on top of the zucchini. Cover the feta mixture with shredded cheddar cheese. Arrange sliced tomato on top of the cheddar cheese. Bake in the oven, covered, for 45 minutes. Each casserole makes about 8 servings. Divide up and enjoy!!! Oh yeah – this is one of our favorites. This has made so many lunches of ours happy! !